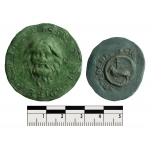 Seal shows head of John the Baptist with star, sun and crescent moon on left and right, set within legend. 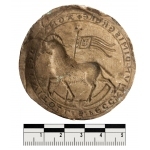 Counter-seal shows a lamb with a three tailed flag carried upon a patriarchal cross. 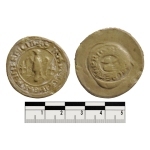 Cast of a seal of The Priory of Corbeil, 1226. 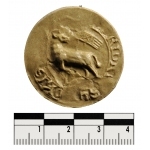 Cast of a circular seal with an Agnus Dei surrounded by legend. 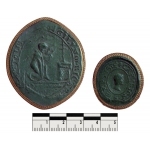 Around the edge of the seal reads: Collection des Archives Nationales. 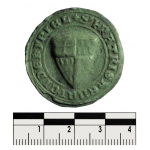 Cast of a circular seal with a central fleur-de-lis surrounded by legend. Around the edge of the seal reads: Collection des Archives Nationales. 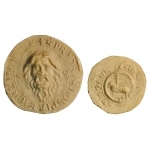 The cast of the seal shows head of John the Baptist surrounded by legend. 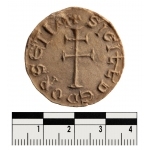 The cast of the counter-seal has an Agnus Dei with a three tailed flag carried upon a patriarchal cross. A shield of arms quarterly, 1st and 4th with a cross patee, and 2nd and 3rd vairy. 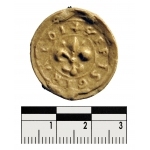 Circular cast of a seal showing the Agnus Dei with legend around whole. 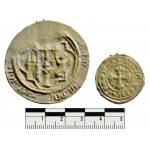 Two casts of seal and counter seal of the Grand Priory of France and Secretum of the Prior. Circular, patriarchal cross with legend around whole.